Standard Time: 10:00 a.m. to 10:00 p.m.
Lines of products and / or services: meshes, wine, moscatel, agribusiness, family agriculture, vinicolas and kiwi. 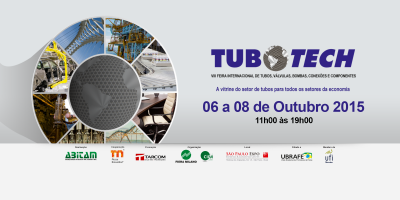 TUBO TECH,PIPES, FITTINGS AND COMPONENTS INTERNATIONAL FAIR,6-8 OCT. 2015,SAO PAULO. 12th International Fair of Technology for Industry Meat and milk,11-13 AUGUST,2015,SAO PAULO,BRAZIL.